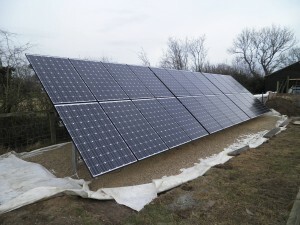 We tend to think of solar panels as roof mounted, but in many cases it is desirable to mount them on the ground. This may be because a roof is not suitable for some reason, or perhaps a better orientation can be achieved from a ground mounted system. A common method of ground mounting for solar panels is to use a purpose-made mounting frame. This can consist of support posts driven into the ground, onto which a frame is bolted, or a frame may be bolted down to specially cast concrete slabs. Some such systems are adjustable so that an ideal tilt angle can be selected for the maximum yield. As the solar panels are mounted as two rows in portait, this type of mounting system allows us to fit a lot of panels into a given area. A useful alternative method of ground mounting is to use the Renusol Console system. This consists of durable, UV-stable polyethylene boxes containing either concrete flags or stone chippings to prevent them moving. The solar panels are then attached to them forming a lid. The low height of the system provides aesthetic appeal, which may help if planning consent is required for the site. If the site is subsequently required for another use, the system can be easily moved.